Does Islam Ban Dogs or is this a hysterical phobia caused by misinterpretation? Al KahfSurah 18. The Cave, verses 13-27, so that we may better understand the correct and authentic Islamic perception about dogs. And We made their hearts firm and strong: they stood up and said: Our Lord is the Lord of the heavens and the earth, never shall we call upon any ilah (god) other than Him; if we did, we should indeed have spoken a terrible lie an untruth. These our people have taken for worship gods other than Him: why do they not bring forward an authority to show that what they do is good? who does more wrong than he who invents a lie against Allah. And when you withdraw from them, and that which they worship other than Allah, seek safety in the Cave: Your Lord will shower His mercies on you and will give you what you will need of provision, dwelling, etc. You would have thought that they were awake, when they were asleep, because We caused them to turn to their right and to their left sides: their dog stretched his two fore-legs on the threshold of the cave: if you had come up on to them and looked closely, you would have certainly turned and ran from them , and would certainly have been filled with fear of them. we woke them up (from sleep), so that they could ask questions of each . one of them asked, "How long have we beem here?" They discussed this and surmised that it was maybe a day or more, in the end they all agreed that Allah alone knows best as to how long they had been sleeping. one of them was sent to the town with some money and told to bring back the best food to be found so that they may eat, but he was to be very careful and polite and make sure that no one found out about them. The reason for the secrecy was that if they were found they would be stoned or forced to turn away from Allah, and they would never prosper. They were told about all of these things so that they might know that the promise of Allah is true, and that there can be no doubt about the Hour of Judgment. They were told to remember the arguement between the people of the city, some of them wanted to build a shelter over them as Allah knows all about them, but those that one the discussion were most probably the disbelievers.. they wanted to build a place of worship over them. They disputed the number among them (Some) say they were three, the dog being the fourth ; (others) say they were five, the dog being the sixth, yet others say there were seven, the dog being the eighth. In truth: "Allah alone knows best how many there were, and therefore should be no discussons or arguments concerning the affairs of the Sleepers. Without adding, "So please Allah!" and always remember Allah when you forget to do and say, "I hope that Allah will guide me ever closer to the right road. In truth Say: "Allah knows best how long they stayed: with Him is (the knowledge of) the secrets of the heavens and the earth: Allah clearly sees, Allah hears finely everything! There is no protector other than Him; nor does He share His Command with any person whatsoever. Recite, understand and follow the teachings of the book .. the Holy Qu'ran that which has been revealed to you Oh Muhammad (pbuh) and act on its orders preaching them to men. None can change the words of Allah, and none will you find as a refuge other than Him. Please click link for full translation and transliteration of the Holy Qu'ran. This Story in the Holy Qu'ran is about a group of believers many years ago, who escaping from persecution because of their belief in Allah, hid in caves. It describes quite clearly that there was a dog amongst them, and as well as giving protection to the people of the cave Allah also gave protection to the dog in their company. Also in the Holy Qu'ran, Allah says that it is lawful to eat whatever the trained hunting dogs catch. "If the hound catches the game for you, you may eat of it, for killing the game by the hound, is like its slaughtering. But if you see with your hound or hounds another dog, and you are afraid that it might have shared in hunting the game with your hound and killed it, then you should not eat of it, because you have mentioned Allah's name on (sending) your hound only, but you have not mentioned it on some other hound. Ibn Mughaffal reported: The Messenger of Allah (may peace be upon him) granted concession (to keep) the dog for hunting and the dog for (the security) of the herd, and said: When the dog licks the utensil, wash it seven times, and rub it with earth the eighth time. 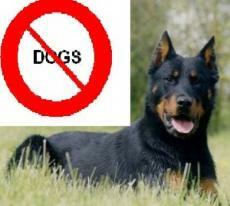 In Islam it is permissable to keep a dog, although it is preferable not to. Let us recall what is halal and haraam in Islam. i.e things which are permissible and forbidden in Islam, are for our goodness. Allah (swt) labeled things as haram to protect us. It does not say anywhere in the Qu'ran that dogs (except to eat them, because they are a carnivore) are haram. All of the decisions on dogs and dog ownership are in hadiths. In fact the Prophet's love, kindness and tenderness toward animals are well established in history. There's a very popular and well-known historical incident illustrating just this.. according to this incident, as the Prophet's (pbuh) army marched toward Makkar to conquer it in the year 630, they passed a female dog with puppies. On seeing this, the Prophet (pbuh) felt so much compassion that he not only gave orders that the puppies and their mother must not be disturbed, but also posted a man to see that this was done. The holy prophet told of a prostitute who,on a hot summer day, saw a thirsty dog hovering around a well, with his tongue lolling out of his mouth. She lowered her socks down the well and used them to give water to the dog.Allah forgave all her previous sins for this one act of kindness. So clearly it is permissable to keep a dog,as long as that dog serves a purpose, whether it be herding the sheep, hunting, farming or guarding a property. 1. A trained dog for hunting. Remember in Islam we are only allowed to hunt for food; there is no such thing as hunting for fun, for we are not allowed to kill or torture animals or drive them out of their habitats for the fun of it. 2. A trained dog as a guide. This would be the case if a person is blind and he/she has no choice but to keep a dog for essential services. In this case, it is permissible for him/her to keep a dog inside the house once it has been trained for service, but it is still recommended that the dog have its own sleeping arrangement. 3. A dog trained for police duties. 4. A guard dog to guard houses or property. 5. A dog used by farmers to shepherd cattle and sheep. Dogs are not created to be used as accessory items. The dog was created for a purpose as was every other living thing, it needs to be able to work to be busy. It is not natural for an animal to be caged inside a home without its basic needs being met.. IF you are contemplating getting a dog, make sure it is for the correct reason.. a dog is not haraam, but having it only as a household pet is..
As with any thing else no one would consider making salaat without proper wudu, so the issue of being unclean does not come into it... this is common sense. The Quran does not state a single word against dogs, and the Prophet never disallowed or discouraged anything that isn't forbidden in the Quran. © Copyright 2019 Adile . All rights reserved. Islam has NO dog-phobia. Islam simply tells us that the saliva of the dog is dirty and wherever the dog will drop its saliva, no angel will come to that place. Now, we Muslims ALWAYS have angels around us. On our shoulders, in our houses right beside us. So no Muslim wants to lose them. That's why Muslims can keep a dog for protection but must remember the consequences. I Challenge the Church! Or You!